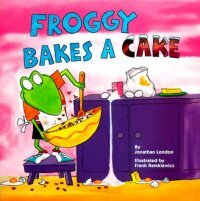 It's Froggy's mother's birthday, and Froggy wants to bake her birthday cake all by himself. He gathers the chocolate, the sugar, the milk, the eggs, the flour, and pretty soon, Froggy has all the ingredients he needs to make…a big mess! Froggy discovers that baking a cake is a little harder then he thought. While the cake is baking Froggy sings "Oogelly boogelly burbly bake. I make and I bake and I wait for the cake". Nothing seems to go Froggy's way. From popping party balloons, and spilling lemonade, to the BIG EXPLOSION! Yep, you guessed it his cake explodes. Froggy winds up giving his mother a fresh pie he made all by himself. A "mud pie" that is and as with all mothers she loves it. This is a birthday Froggy and his mother will never forget, and neither will your preschooler. Jonathan London and Frank Remkiewicz have collaborated on several previous Froggy books. They've cooked up another winner here, sweetened with generous helpings of Froggy humor and charm. The Froggy character is easy for preschoolers to identify with. He makes mistakes as all kids do. This humorous books is definitely a preschool winner. As with all the Froggy books Frank Remkiewicz does an excellent job with the illustrations. They are colorful and eye pleasing. I recommend this story for preschool children ages 3 –5.